One of the best things about WordPress is how well it scales alongside your skills. You can pick up the platform and create a successful site with no technical knowledge. However, as you become more comfortable, you may start wondering how to become a WordPress developer. Fortunately, you don’t have to jump right into the deep end. There are plenty of ways to ease your way into the world of WordPress development and start honing the skills you’ll need. Your preexisting knowledge will play a role in how much of a learning curve there will be, but this is a field nearly anyone can get involved in. To help you get started, we’re going to talk about how to become a WordPress developer, focusing on what you’ll need to know and introducing some resources to help. 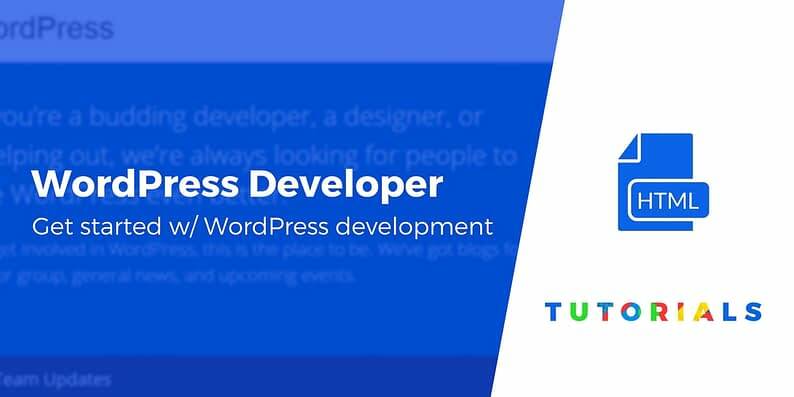 Want to become a #WordPress #developer? Here's how to get started! The Make WordPress website is the perfect place to learn about all the ways you can get involved in WordPress development. Before we get started, let’s clear something up. When we talk about learning how to become a WordPress developer, we’re not just talking about taking up development as a full-time endeavor. You can certainly do that, of course. However, there are lots of reasons to dip your toes into WordPress development, even on a part-time basis. You want to customize your site more fully than is possible through default options. Existing plugins and themes aren’t providing what you need, so you want to create your own. You’d like to make money through WordPress development, such as by selling plugins, themes, or websites. You want to contribute to WordPress itself, by developing for the core platform. No matter what your reasons are or how ambitious your plans might be, you’ll want to start with some basics. Let’s talk about what’s involved in learning how to become a WordPress developer. There are a lot of avenues into WordPress development – no one path is right for everyone. However, there are some common things any beginner will want to do. In the following steps, we’ll help you prepare to jump into the wide world of WordPress development. Knowledge is power – rarely is this truer than when it comes to development. The most important criteria for learning how to become a WordPress developer is familiarity with the languages the platform is built on. PHP: This scripting language forms the backbone of WordPress, and is required for a lot of behind-the-scenes work. HTML: This markup language determines how a site’s web pages look in the browser. CSS: This language adds style to a site’s content, such as colors, fonts, and so on. These are just the very basics, of course – each of these languages is used in a wide variety of ways. If this list seems overwhelming, you’re best off focusing on HTML and CSS to start with. These are more beginner-friendly and straightforward languages, yet there’s a lot you can accomplish with them. For those starting from scratch, W3Schools offers some very approachable tutorials for both CSS and HTML5 (the latest version). In addition, we’d recommend experimenting with using these languages to make changes to your existing WordPress website(s). With technical skills, practice is the best way to advance. Just make sure to use a staging site, or at least back up your live site first. WordPress’ wide popularity comes with many benefits. For instance, there are a lot of resources you can use to learn how to become a WordPress developer. The WordPress Codex. If you haven’t already, this is a site you’ll want to become intimately familiar with. In particular, check out the list of developer-focused documentation. Dedicated WordPress courses. Sometimes, having an expert walk you through the basics is the best way to learn. You can find free and premium WordPress courses on general topics, development minutia, and everything in between. The WordPress.org developer site. Here you can find guides to developing themes and plugins, as well as more advanced topics like the REST API. The Make WordPress website. This is a central hub for WordPress contributors of all types – developers, designers, translators, testers, and so on. We also put together our own big list of 120+ cheat sheets for WordPress developers. As we’ve alluded to, WordPress development is a pretty broad field. There isn’t just one place to get started, which means you can jump in wherever you feel most comfortable. Let’s take a look at some of the most common ways to start developing for WordPress, and how to get started with each. If you’re not quite ready to start developing from scratch, one way to learn the ropes is by altering an existing theme or plugin. This lets you experiment with making changes and testing the results, without having to come up with something completely new. However, a better option is often to ‘adopt’ a plugin or theme that’s been abandoned by its developer. This also lets you experiment with existing code, and you can even resubmit your improvements if you like. You can find a more in-depth guide to taking over existing plugins here (much of the same information also applies to themes). If you’re feeling a bit more ambitious, you may want to try your hand at developing a new plugin or theme. Starting with a plugin is usually the better route, as you can pick out one specific feature you’d like to add to WordPress and work out how to make it happen. If your plugin turns out well, you can even submit it to the directory. To jump into this area of WordPress development, you’ll want to start with the WordPress Codex entry on creating plugins, as well as the Plugin Handbook. There are similar resources for building themes as well. You may also want to check out the WordPress forums – you might be able to find a team you can collaborate with there, which is easier than trying to develop a new plugin all on your own. Finally, some people who want to learn how to become a WordPress developer are more interested in contributing to the platform itself. If this sounds like you, you’ll want to take a somewhat different approach. The best way to get started is to first check out the Core Contributor Handbook. This offers a lot of vital information about what it means to work with WordPress as a developer. After, you can get your feet wet by helping to test out bugs, beginning with those that have been earmarked for first-time contributors. Fixing bugs lets you work on the platform while learning the ropes. In addition, it will get you in contact with more experienced developers who can help you out. Over time, you’ll be able to work your way up and start contributing to whatever types of projects strike your fancy. Learning how to become a WordPress developer can seem out of reach if you’re new to the field. However, WordPress is actually one of the best places to learn development, thanks to its approachable nature and vast, supportive community. Learn (or brush up on) your basic web development languages. Do plenty of research, and consider taking a few dedicated courses. Decide on a way to get involved, and jump right in. Do you have any other questions about how to become a WordPress developer? Ask away in the comments section below!